Alexander Lobrano is the Consulting Features Editor for Paris by Mouth. 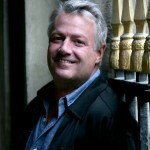 Alec was European Correspondent for Gourmet magazine from 1999 until it closed in 2009, and has written about food and travel for Bon Appetit, Food & Wine, Travel & Leisure, Departures, Conde Nast Traveler, and many other publications in the United States and the United Kingdom since he moved to Paris in 1986. He is a contributing editor at Saveur magazine and a regular contributor to the New York Times, the Wall Street Journal, and the Guardian. In 2011, he was awarded the IACP’s Bert Greene award for culinary writing for his article “Spirit of the Bistro” in Saveur magazine. He is the author of Hungry for Paris: The Ultimate Guide to the City’s 109 Best Restaurants , Second Edition (Random House, 2014) and Hungry for France (Rizzoli, 2014).